This tie features a unique application of natural, sustainable cork. 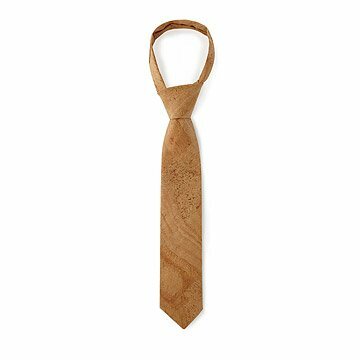 Bring a truly organic touch to your haberdashery with this natural cork necktie. Incredibly thin and flexible layers of cork adorn this knot-able tie, displaying the warm, buff color, organic variations, and inviting softness of natural cork. A sustainable material, the bark of the cork oak regenerates within 7-9 years after harvest, and the process extends the life of the trees to over 200 years. This unique tie makes a distinctive statement paired with jeans and an Oxford, or a go-to gift for the "guy who has everything." Handmade in Portugal. This was a perfect gift for Father's Day. It was surprisingly soft, as if it was made of a fine fabric. Love the look of this tie, but it definitely has a more casual look. Would look great with jeans, but I'm not sure you could pull it off with suit or anything. Perfect for my husband who has to wear ties to work from time to time. I wish it had come with the waterproofing treatment it says must be applied before wearing. Or the instructions include a product name so I would know what to purchase. This is a lovely, soft tie that everyone is truly amazed by. Couldn't be happier. My product was ordered as a Christmas gift. As I have said, this product arrived in unique packaging, and I am going to wrap it that way. Therefore, I have not inspected the tie, but I am sure it will be okay-at least I hope it will be!!! This was the perfect gift for my man! My man loved this tie! He always dresses well and is enviromentally conscious, so this tie worked. Thank you so much.